We got to the Carousel of Projects right before the Expo opened to the public. It was a little wait to go into the little room that shows a quick movie. The movie was not that interesting and we ended up stuck in the back because they held the wheelchairs off to the side and ended up in last with others cutting ahead. Mik was annoyed that he could not see anything, but I could pretty much see everything and it really was not like he missed anything great, although it was kind of cool how the exit thing worked with Tinkerbell opening the curtain to the exhibit. Inside the exhibit area it was quite kind of crowded, but it was not too bad to go around and see everything. 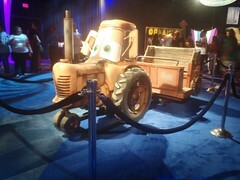 I liked seeing the concept vehicles for the new Carsland, especially watching the firetruck's eyes. However, we actually are not interested in the new land, as it does not seem any of the new rides will be the type that can be accessible, although the flying saucer style one Mik would try if we brought along someone to transfer him. 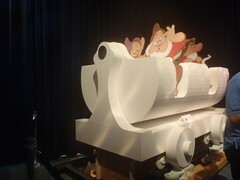 Mik loved seeing the concept vehicle for the new Seven Dwarfs Mine Train ride for the new Fantasyland area at Disney World. We knew about the ride and he is not actually interested in it, as he is not into roller coasters, but he loves Grumpy and liked seeing him as one of the dwarfs in the ride vehicle.